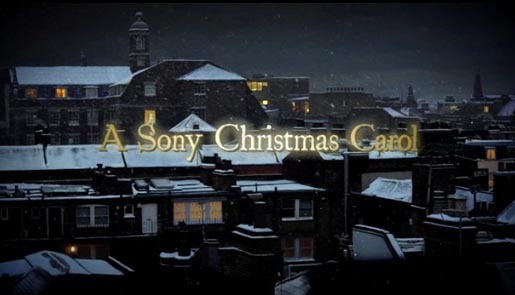 Sony is promoting its “VAT Back” offer in the lead up to Christmas with “Christmas Carol”, a TV advert featuring Derek Jacobi as Ebeneezer Scrooge. Sony UK is offering customers ‘VAT Back’ across its product range in a move to help the nation save money on Christmas presents such as BRAVIA (3D) TVs, Cyber-shot compact cameras, e-Readers and Blu-ray players, as well as other larger electronic purchases ahead of the forthcoming UK VAT increase in January 2011. The advert opens with a bedraggled Scrooge alone in a gloomy London flat on Christmas Eve. He reads a newspaper headline and voices the message aloud ‘V.A.T back…Sony…ends Christmas Eve,’ which transforms him from the well known cold Scrooge character to a new warm man full of the joys of Christmas and inspires him to purchase a wealth of Sony gifts for his friends and family. The print advertising will feature the exact same newspaper advert that Scrooge reads in the TV commercial. The campaign was developed at Crayon London, and True Worldwide, London. The online hub for the campaign was developed at DARE, London. Filming was shot by director Jonas Åkerlund via RSA Films. In-store activation has been handled by creative agency Crayon London. Media was bought by OMDUK. The score for the advert was specially created by composer Ilan Eshkeri and features the piano playing of Lang Lang, recorded in Paris. Backing by a 35 piece orchestra was recorded at Abbey Road Studios, London. Download the track at iTunes and Amazon UK.